On Monday, July 30th, musicians and fans alike came together to support Make Music Matter at Hugh’s Room in Toronto. Formerly Song for Africa, Make Music Matter is a registered charity that utilizes the power of music to educate and ultimately eradicate some of the world’s most deplorable issues in developing nations. A Night to Make Music Matter was produced by the Event Production & Management students of Metalworks Institute under the guidance of Event Management instructor Don Quarles, and the event raised over $3,400 for Make Music Matter. A Night to Make Music Matter was hosted by Michie Mee, Canada’s Queen of Hip-Hop. Artists included Dan Hill, Tim Edwards (Crash Parallel), Luke McMaster, Jesse Labelle, Julie C, Menage, Sixteen Different Minds and Mark Christiano. Grammy award winning producer David Bottrill and Jit Lahiry spoke at the event about the important work that Make Music Matter is doing. 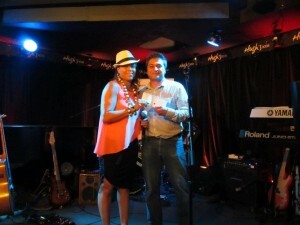 Among other funds raised that evening, a cheque for $1000 was presented to Jit by host Michie Mee from the Mississauga Injury Law Firm for Make Music Matter. Dan Hill closed the show with a beautiful rendition of “Sometimes When We Touch” with the house band. Make Music Matter is working to build operations in three locations across Rwanda and the Democratic Republic of Congo (DRC) that will tackle a wide variety of developmental/human rights issues including HIV/AIDS orphans, child soldiers, and women and children who are survivors of sexual violence. Funds will be used for their Music Enrichment Program. Sponsors and donors of silent auction items include Hugh’s Room, Mississauga Injury Law Firm, Dr. Ben Ayanbadenjo, Canadian Opera Company, Maple Leaf Sports & Entertainment, Songwriters Association of Canada, ProForma Northern Lights, Club Concierge and others. Metalworks Production Group supplied equipment for the event. Special thanks to Joe Natale, Andy Linden, Ron Rogers, Dave Patel, Wendy Irvine, Curtis Freeman, Jamie Bonk, and Metalworks Institute Academics Director Craig Titus.